I’m starting to feel bad whenever I post a profile page. It seemed like a good idea at the start, but I’m pretty sure some of you think it’s a lazy move from me considering I only have a “once a week” update schedule. Really, though, I needed the break, with the Geekfest and my vacation and all. Appealing character design, I like a lot of the details. Yay! Thank you! I’m always happy when people enjoy my desings! I know, I feel the same way. Ever considered going into the designing glasses frames business? …okay, now I see where PM was coming from with the Pinkie Pie voice mention. The voice in my head still leans closer to Bubbles, though. 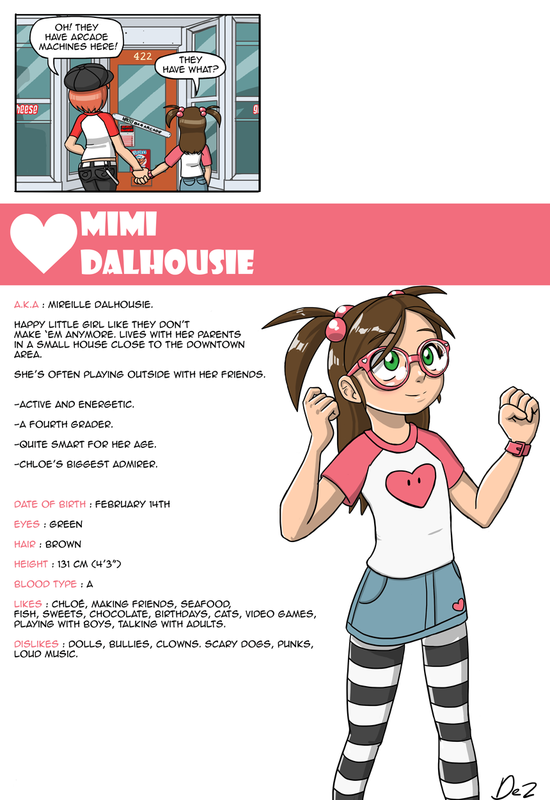 Funny that her last name Dalhousie, sounds like Dollhouse, yet she doesn’t like dolls. Sorry, I’m still working through the archives to get current. Dez’s comments on DoA led me here. Hehe. Like every last name in Frivolesque, Dalhousie is the name of a Street in Quebec City. The fact I speak both french and english also made me make this “Dollhouse” connection a few years ago. I guess that’s why I ended up giving the name to a little girl subconsciously. They are at Macfly! Does Mimi can enter there? Usually most webcomic authors put character profiles in their cast section, but I like the way you’ve done it: giving us the 411 on each character as they’re introduced. Don’t feel guilty about being perceived as lazy. Most webcomics schedule updates two or three times a week, if they aren’t on hiatus. Yours seems to be doing fine. Keep up the good work! But I only update once a week!! Anyway, thanks! I like being quirky like that! Parents, relax a bit. Your child is 161 times more likely to be abused by YOU than the literal one-in-a-million stranger whose basic primal instinct to protect children at all costs is broken. They’re many orders of magnitude more rare than the sensationalist media would have you believe.